The ProForm SMART HIIT Trainer Pro is the long anticipated answer to the popular Bowflex Max Trainers. This machine compares specifically well to the Bowflex M6 and M8 models. All of these machines are vertical ellipticals with a steep 10” vertical motion that activates more muscle groups and creates a sweat inducing/heart pounding/air gasping workout in no time flat. They use the principles of HIIT workouts to burn more calories and ramp up your metabolism. For those unfamiliar with HIIT training it stands for “high intensity interval training”, which is the recent rage in the fitness industry. The theory is by alternating intermittent high intensity workouts with cool downs you can achieve better results in less time. In fact, many professional athletes adhere to training regiment. The ProForm SMART HIIT Trainer Pro comes from the same manufacturer as the well-known NordicTrack brand. Both ProForm and NordicTrack are recognized for providing higher specs at a lower price. You really do get ‘more for your money’ with these brands. Read on to see our comparison of the ProForm SMART HIIT Trainer Pro to the Bowflex Max Trainer M6 and M8 models. 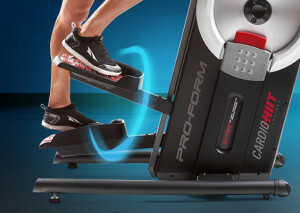 WEEKEND SALE ENDS MONDAY: The ProForm SMART HIIT Trainer Pro is $1,399 with Free shipping. Financing is available. This is $200 OFF the Regular Price! Vertical Elliptical Path for HIIT Workouts – As mentioned, this machine is specifically designed for HIIT (high intensity interval training) workouts. These short and intense sessions followed by short recovery periods help your body activate more muscle groups and burn more calories. The 10-inch vertical path of this elliptical type will feel like boxing footwork while your upper body gets a powerful workout holding onto the multi-grip handlebars. The entire machine provides this intense workout while protecting your joints from any jarring impacts. The pattern on this machine tends to be a bit more vertical (up-and-down, not circular) than on the Bowflex machines. 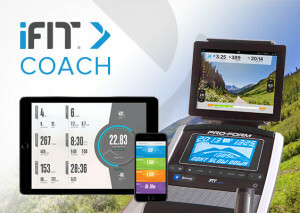 iFit Coach – One of the best perks on any ProForm or NordicTrack machine is their incorporation of the iFit Live programs. This iFit Coach Ready machine allows you to complete workouts filmed in exotic locations around the globe. You’ll view the landscape on the color display right on your machine. Google Maps syncs with your machine to recreate the actual hilly terrain of your virtual destination. Customize your workouts and track your results on your online account. The only downside to this program is that an annual subscription fee is required for ongoing use. You can get the first year of iFit Membership for FREE with your purchase. 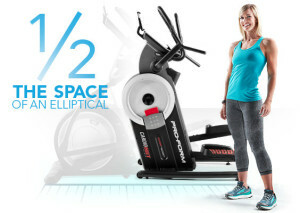 Size and Movability – This machine takes up roughly ½ of the space of a traditional elliptical. Its small footprint makes it ideal for smaller homes or offices. There are front-mounted transport wheels so you can move it into a corner when not in use. Stability – The SMART HIIT Trainer Pro weighs about 180 lbs., which is a 37 lbs. heavier than the Bowflex M5 and M7. A heavier machine is going to be a bit more stable during the workout with less wobbling. Full Body Engagement – The ProForm SMART HIIT Trainer Pro will provide a full body workout in only a few minutes. The vertical elliptical path (10” vertical and 5” horizontal) will activate your calves, hamstrings, quads, glutes, biceps and triceps. 26 Resistance Levels – The SMART HIIT Trainer Pro uses patented SMR (Silent Magnetic Resistance) to simulate 26 digital resistance levels. This is a generous selection of levels to accommodate various experience levels. 34 Workout Apps – You certainly won’t get bored with this array of options! The ProForm SMART HIIT Trainer Pro offers more workout options than the Bowflex competition models. 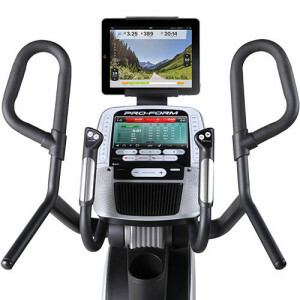 10” Smart HD Touchscreen – Here is one of the top perks for this machine over the Bowflex models. This screen will show your basic stats of speed, time, distance, calories, heart rate, and incline. Swipe through for easy viewing. Plus, it will allow you to access features like websites and YouTube while you work out. It’s easy to use and we liked the vibrant display. 30 lb. Flywheel – A heavier flywheel allows for a smooth and more natural feeling elliptical motion. Warranty – There is a lifetime frame warranty, 5 years on parts, and 2 years on labor. The main competition for this model is going to be the Bowflex Max Trainer M6 (priced around $1,699) and M8 (priced around $2,299). Both of those machines are comparable in price to ProForm SMART HIIT Pro which is usually priced around $1,999, and sometimes goes on sale for much a lower price. Bowflex also has an M3 model for $999. Overall, the ProForm SMART HIIT Trainer Pro has many more resistance levels and workout programs to choose from. Plus, the SMART HIIT Trainer Pro comes with a 10” HD touchscreen while the Bowflex brand only has an LCD Display. It’s really hard to argue with this feature comparison since a touchscreen really enhances the entire workout experience. Both machines have the ability to track your workouts and make recommendations on training plans. The Bowflex machine uses the Max Intelligence Platform while the SMART HIIT trainer uses iFit Live, both of which require a subscription fee. One major difference here is that the SMART Trainer Pro uses the 10” HD Touchscreen to access this content, while the Bowflex models require you to provide your own device. 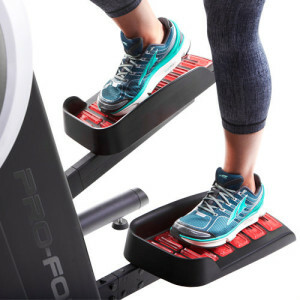 Overall, if you are looking for a great vertical elliptical for a lower price, you will be very pleased with the SMART HIIT Trainer and SMART HIIT Trainer Pro from ProForm. ProForm stays true to their mission of providing more specs at a lower cost than the competition with this effective machine. If the annual subscription for iFit isn’t something you’ll use (and you don’t mind losing the 10” color touchscreen), then the Bowflex M6 is going to be a comparable option. Read a more in-depth comparison of the two machines here. ProForm SMART HIIT Trainer – Read our full review here. The SMART HIIT Trainer and SMART HIIT Trainer Pro are very similar machines with around a $500 difference in price. For the additional money, you will get a 2 lb heavier flywheel, 2 additional programs, a 10″ Smart HD Touchscreen, 2 additional resistance levels, and a 2 yr additional parts warranty. Honestly, the $999 price on the SMART HIIT Trainer is a very attractive offer. You get a lot of machine for a great price. The main attraction to buy the SMART HIIT Trainer Pro is that 10″ Touchscreen. We feel that additional money may be better spent purchasing a smart tablet of your own that you can use both on and off your fitness equipment. So, overall, our top recommendation is that you purchase the SMART HIIT Trainer instead of the SMART HIIT Trainer Pro. 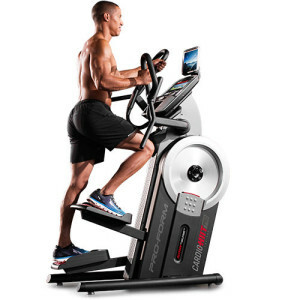 Check out a comparison chart of all the ProForm ellipticals.